Listen to television and radio host, Richa Anirudh speak to the former DGP of U.P Police, Prakash Singh, on how rumours affect an investigation and eventually the course of a trial. When Aarushi was found dead, suspicion turned to the Talwars’ missing help, Hemraj. And when Hemraj’s body was discovered the case began to show symptoms of a ‘closed door mystery'. No one knew it then, but a press conference would irreversibly turn the way the Noida double murders would be regarded. Listen to Aarushi's best friend give details about the Talwars as a family. Listen to Aarushi's best friend speak about Aarushi with boy friend. Listen to Avirook discuss the source of the rumours and where it all started. 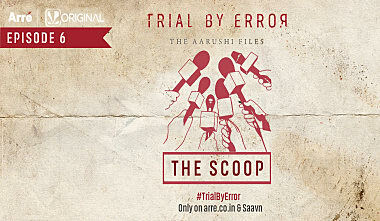 Trial by Error | The Aarushi Files	1.01 What does being characterless imply? Listen to Avirook Sen speak on how Aarushi's character was assassinated.